"Trust me, I'm a wanker!" Welcome, my friends, to the Bank of Mugabe. The Bank that likes to say "Hands up! Give me all your property". 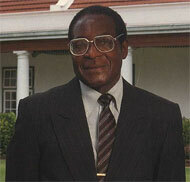 The Bank of Mugabe is proud to call for foreign investment. Bring your money to us. You'll never see it again. Our founding father, Mr M, says "I promise to share your money in the same way that I share power-by committing murder and other nasty crime." The Bank of Mugabe. Because we're morally bankrupt.